Councillors in Wigan are due to vote on whether to withdraw support for the introduction of congestion charges in Greater Manchester. Council opposition leader Peter Franzen has proposed a vote against road pricing in favour of asking for more government money to fund improvements. The 10 local authorities which make up Greater Manchester voted on the plans in summer last year. 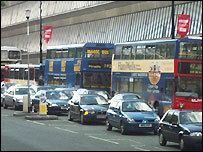 Bury, Trafford and Stockport councils have since rejected the road charges. At the moment only seven of Greater Manchester's 10 local authorities are in favour of the bid to implement road pricing in return for £3bn of public transport improvements. Under the terms of the bid by the Association of Greater Manchester Authorities (AGMA), there must be at least a two-thirds majority among the 10 councils for it to go ahead. Greater Manchester is among 10 areas in England which have government money to develop possible congestion-beating plans in the hope of getting finance under the Transport Innovation Fund (TIF). Manchester will seek £1bn from the TIF, and plans to borrow a further £2bn, which will be repaid by income from the congestion fees. The cash would be spent on an extension to the Metrolink tram system and more investment in buses and trains. Is the C-charge right for Manchester? How will the charge work?